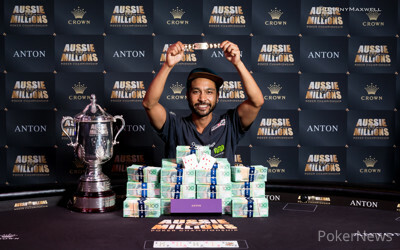 Congratulations to Shurane Vijayaram, Winner of the 2017 Aussie Millions Main Event for $1.6 Million! 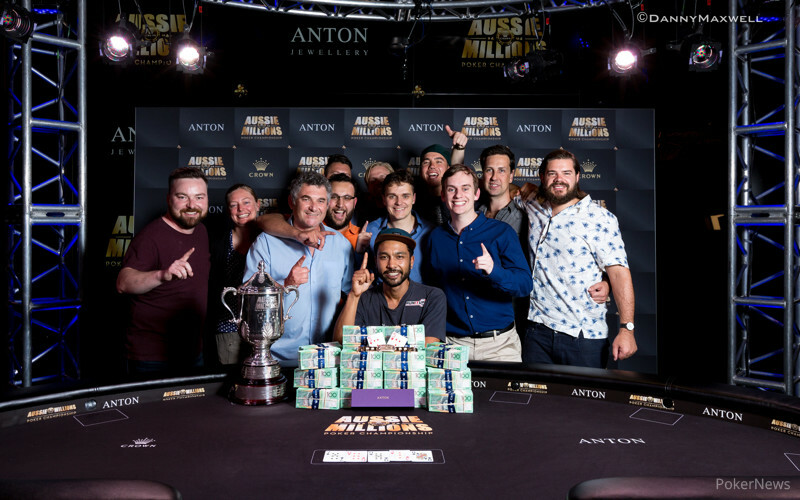 What a final hand to end a fantastic event, and with that Shurane Vijayaram has become the 2017 Aussie Millions Main Event champion! Vijayaram’s AU$1.6 million-victory came after a relatively short heads-up battle with an amazing river call to end the event. Unfortunately for Ben Heath, his all in jam on the river didn’t get past Vijayaram, who took his time evaluating the entire hand before making one of the best hero calls you will ever see! For Vijayaram, the win marked one of the most amazing poker stories you will hear. Only a week ago Vijayaram entered a Sunday night $130-rebuy tournament here at Crown Casino and won himself a seat into the Main Event. One week later and that $130 has turned into a seven-figure score. And that is Vijayaram's first ever recorded cash after never before making the money, in any event, he's played. At the start of Sunday's final table, seven players remained from a starting field of 725 — the third-largest Aussie Millions Main Event in its 20-year history. First to go was Australia's own Luke Roberts, and he was followed by the only American at the table, WSOP bracelet winner David Olson. Roberts took home AU$215,000, and Olson scored AU$270,000. The next two places on the payout sheet were filled in by the two most experienced and decorated players at the final table. First, it was Germany's Fedor Holz falling in fifth place for AU$335,000, and then Australia's Jeff Rossiter took fourth for AU$445,000. For Holz, it marked an incredible couple of days after finishing 3rd in the ANTON Jewellery $100,000 Challenge just a night earlier for AU$352,800. Rossiter also made some history, making another deep run here in Melbourne, after finishing in 3rd place back in 2011 for AU$700,000. Along with the aforementioned Holz, Tobias Hausen was the other German pro at the final table, and he advanced into the tournament’s last trio of players. While he held his own throughout the day and even made an additional pay jump courtesy of the Rossiter's elimination, the big stacks of Vijayaram and Heath proved too much to overcome. In the end, he moved all in with ace-jack and was up against Vijayaram jack-ten. Hausen flopped ace to extend his lead but Vijayaram spiked a queen on the turn to make a straight and that left us with two. Vijayaram entered the heads-up duel with the lead, a lead he held for the most part of the 120-hands leading up to this point, and an entertaining duel it was. Heath tried to pick away at Vijayaram for the entirety of their 29 heads-up hands but could never find that much needed double up to get him back in the game. Eventually, it all had to end and Vijayaram capped off a memorable day with a fantastic call to win it all. Pokernews spoke to Vijayaram right after his career defining score for his take on his first official live tournament cash. “Absolutely amazing, it's like a dream!” Gushed a clearly elated Vijayaram. Vijayaram will definitely have a story to tell down his local pub the next time he pops in for a few hands of poker. “Honestly, I was just getting back into pub poker about four months ago. One of the guys at pub poker, and he's here tonight, asked me if had played any Aussie Millions satellites. I was like 'no, I don't really play that often'. But then I thought about it and thought ‘maybe I will play.’ I went down last Sunday, played it, won it and now I'm here. Perhaps the most impressive part of the Melburnian native’s Aussie Millions adventure was the fact he did not seem fazed by the bright lights and world-class competition. “I was a little bit intimidated on my Day 2, sitting… on Mustapha Kanit's right. He's a really dangerous player and when I first sat down at the table I was really nervous. But after I had taken on some of those players – I played with Tony Dunst on my Day 1 – I got the confidence to trust my read. That's something that this tournament has really strengthened, trusting my read. Before that, I didn't have as much confidence in my read but having that trust and instinct, the unconscious feeling... it's hard to explain.” Said Vijayaram, who went on to state that he didn’t want the seasoned pros at the final table and the pressure of the chip lead affect him. Vijayaram’s confidence in his reads and his game definitely counted for a lot when it came to heads-up play against seasoned circuit pro Ben Heath. “It was tough. Ben has probably played a lot more heads up than I have. I've played heads up but I'm not a heads-up specialist by any means. He made it really tough for me. That call on the river in the last hand, that was a tough call and I had to really analyze the hand and think about what he was representing. He was a really tough opponent and he did really well.” Stated Vijayaram, who went on to tell Pokernews his plans for his poker windfall. The tournament bug will have certainly bitten the Melbournian player and while he said he does not play that many tournaments we’re pretty sure that will change going forwards. For Heath, a cool seven-figure payday will definitely be something he can talk about for years to come, but the spotlight tonight is all about Vijayaram. Hand #169: The action started with Shurane Vijayaram raising to 350,000 from the button and finding a call from Ben Heath in the big blind. The flop fell and Heath checked. Vijayaram fired out 400,000. Heath called. The turn brought the and Heath checked. Vijayaram bet out 500,000 before Heath came over the top with a raise to 1,390,000. Vijayaram thought for a minute then cut out the chips to call and slid them out. The completed the board and Heath moved all in for 3,200,000. Vijayaram went into the tank for five minutes as he deliberated over his decision. In the final stages, he ran through the hand convinced himself that Heath had missed a draw and called the all in. Heath reluctantly flipped over his for king-high and Vijayaram nodded his head before tabling his for a pair and the winning hand. 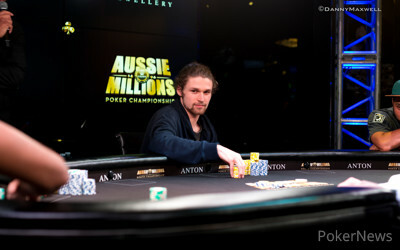 Heath takes home AUD$1,000,000 for his efforts after finishing in second place. The figure instantly doubles his career earnings after a solid week at the tables. Hand #165: Shurane Vijayaram raised to 375,000 from the button and was called by Ben Heath in the big blind. The flop fell and Heath check-folded after Vijayaram threw out a continuation bet totalling 400,000. Hand #166: Ben Heath limped in on the button and Shurane Vijayaram called from the big blind. The flop came and Vijayaram checked. Heath reached for his chips and splashed out 160,000. Vijayaram folded. Hand #167: Shurane Vijayaram called from the button and Ben Heath didn't want to add any more chips from the big blind before both players watched the flop fall . Heath checked over to Vijayaram who bet out 300,000. Heath then raised it up to 1,085,000 and Vijayaram thought about his decision. A minute passed and Vijayaram called. The turn brought the and Vijayaram immediately slid out a bet worth 2,000,000. Heath snap-folded and Vijayaram took it down. Hand #168: Ben Heath called from the button and Shurane Vijayaram followed suit from the big blind. Vijayaram checked the flop over to Heath who bet out 160,000. Vijayaram called. The turn brought the and Vijayaram checked once more. Heath slid out 585,000 which was enough to take down the pot as Vijayaram mucked his hand. Hand #160: Ben Heath limped on the button and Shurane Vijayaram checked his option with before a flop of . Vijayaram checked, Heath bet 160,000, and Vijayaram called to see the turn card. It was then checked to the river where Vijayaram led out for 300,000. Heath paid it off and the pot was awarded to Vijayaram. Hand #161: Shurane Vijayaram raised to 325,000 with on the button before Ben Heath three-bet to 950,000. Vijayaram made the call and the flop was spread . Vijayaram checked and after Heath fired for 950,000 Vijayaram went into the tank. Ultimately he opted for a fold and Heath won the pot. Hand #162: Ben Heath limped on the button with and Shurane Vijayaram checked in the big blind with before a flop of . The action was checked down all the way through the turn and river with Heath’s ace high taking down the pot. Hand #163: Shurane Vijayaram button raised to 325,000 with and Ben Heath defended holding . The flop fell and both players checked to the turn. After another check from Heath, Vijayaram bet 300,000 and was called before the completed the board. The action was checked on the end and Vijayaram raked in the pot. Hand #164: Ben Heath limped on the button and Shurane Vijayaram checked his option before a flop of . Vijayaram led for 160,000 but Heath played back at him for 460,000. Vijayaram flicked in a call and the appeared on the turn. Vijayaram checked it over to Heath and he fired for 475,000. Vijayaram made the call before the rolled off on the river. It was checked by both players on the end and Heath’s pocket sixes were good enough to win the pot. Hand #155: Shurane Vijayaram limped from the button before Ben Heath raised to 480,000 from the big blind. Vijayaram quickly folded and Heath took down the pot. Hand #156: Ben Heath limped into the pot from the button and Shurane Vijayaram followed from the big blind. The flop came and Vijayaram check-called a bet of 160,000 from Heath. The turn brought the and Heath fired out 545,000 after Vijayaram checked. The bet was called. The completed the board and both players checked. Heath showed his for a rivered pair of jacks but it wouldn't be enough against Vijayaram who showed for a pair of aces. Hand #157: Shurane Vijayaram mucked his hand from the button allowing Ben Heath to take down the pot. Hand #158: Ben Heath raised to 450,000 from the button which was enough to take it down after Shurane Vijayaram folded. Hand #159: Shurane Vijayaram raised to 325,000 from the button and was called by Ben Heath in the big blind. The turn brought the and Heath checked. Vijayaram tossed out a bet totalling 300,000 before Heath came over the top with a raise to 985,000. Vijayaram thought for a minute before releasing his hand. Hand #150: Ben Heath limped on the button with and Shurane Vijayaram checked his option with . On a flop of both players checked and the arrived on the turn. A bet and a call brought us to the river where the action was checked again before Vijayaram took the pot. Hand #151: Shurane Vijayaram limped the button with and Ben Heath checked in the big blind holding to see a flop of . Heath checked and then folded when faced with a bet of 165,000. Hand #152: Ben Heath limped on the button and Shurane Vijayaram checked with in the big blind before a flop of . Vijayaram led out for 160,000 and Heath called to see the arrived on the turn. Both players checked and after Vijayaram checked again on the river, Heath fired for 685,000. Vijayaram decided on a fold and the pot was pushed to Heath. Hand #153: Shurane Vijayaram raised to 325,000 on the button with and Ben Heath folded in the big blind. Hand #154: Ben Heath folded on the button and Shurane Vijayaram got a walk with . Hand #145: Shurane Vijayaram raised to 325,000 from the button and Ben Heath called from the big blind. The flop came and Heath check-folded after Vijayaram threw out a continuation bet totalling 180,000. Hand #146: Ben Heath limped from the button and Shurane Vijayaram checked before both players watched the flop come . Both players checked before the dropped on the turn. Vijayaram quickly bet out 160,000 and took down the pot after Heath folded. Hand #147: Shurane Vijayaram folded his hand on the button and Ben Heath took down the pot. Hand #148: Ben Heath limped from the button and Shurane Vijayaram checked his option. The flop fell and Vijayaram tossed out 160,000. Heath called. Both players checked the on the turn before the completed the board. Vijayaram bet out another 160,000 only to then watch Heath raise it up to 885,000. Vijayaram tanked for several minutes over his decision before letting it go. Hand #149: Shurane Vijayaram raised to 325,000 from the button and was called by Ben Heath. The flop came and a single bet of 275,000 from Vijayaram would take it down after Heath folded after initially checking his option. Hand #140: Ben Heath limped on the button with and Shurane Vijayaram check his option in the big blind with . The flop landed and Vijayaram led out for 160,000. Heath called and the paired the board on the turn. Both players checked and the completed the board. Again it went check check on the river and Heath won the pot. Hand #141: Shurane Vijayaram limped on the button with and Ben Heath checked in the big blind holding before a flop of . Heath check-called a bet of 260,000 and the action was checked through after the turn card. Heath led for 485,000 on the river and Vijayaram folded. Hand #142: Ben Heath limped on the button with and Shurane Vijayaram checked in the big blind with . The flop was spread and after a check from Vijayaram, Heath bet 160,000 and took down the pot. Hand #143: Shurane Vijayaram raised to 325,000 on the button and Ben Heath folded in the big blind. Hand #144: Ben Heath limped in on the button with and Shurane Vijayaram checked the big blind with before a flop of . Vijayaram led out for 160,000 and Heath called to see the land on the turn. It was checked through and again after the with Vijayaram tabling the nuts to win the hand.